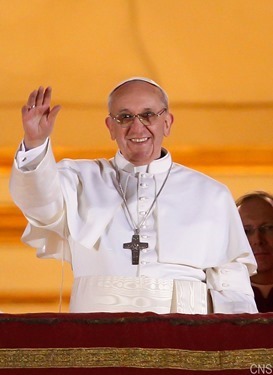 This week we rejoice in the election of our new Holy Father, Pope Francis! 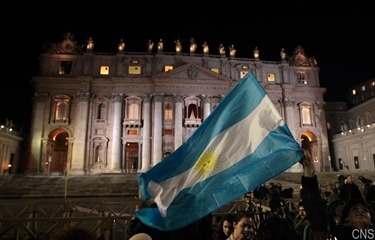 For us, the Holy Father is a great blessing, the first pope from the American hemisphere and, being Hispanic, he is from a part of the world where almost half of the Catholics reside. He is a man who has been very much dedicated to the poor and announcing the Gospel in difficult situations. We know he will be a great blessing for our Church. It was my privilege to visit him a couple years ago. 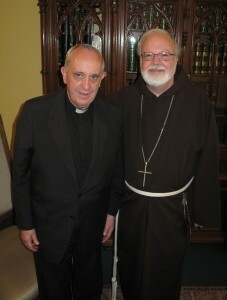 I had met him in different meetings over the years and when I had to make a trip to South America for the US Bishops Conference to visit projects in Paraguay that are funded by the collection for Latin America, I had to stop in Argentina on the way, where I was his guest and had a wonderful visit with him. On that occasion, he gave me a beautiful recording of the Missa Criolla, the Argentine Mass. 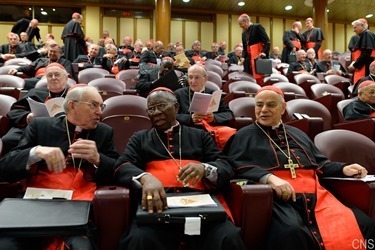 In the time leading up to the conclave, we had several days of meetings, which are called congregations, in which the Cardinals talk about the situation of the Church in their countries and our hopes for the new pontificate. Father Raniero Cantalamessa gave the first meditation to us during the congregations. 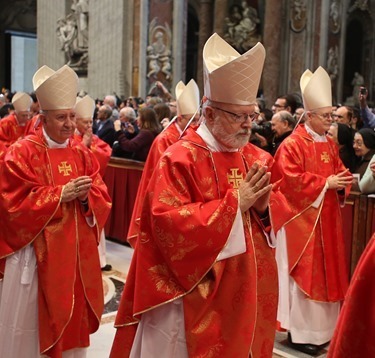 Sunday, before the conclave, each of the Cardinals went to celebrate Mass at their titular church, praying for God’s guidance in the conclave and so I went to my church, Santa Maria della Vittoria. 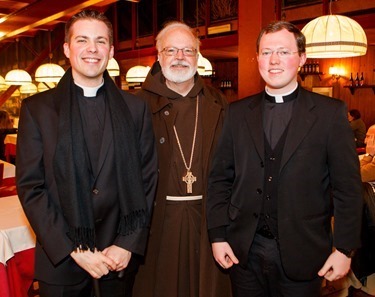 Our seminarians and priests who are in Rome, including Father Salocks, Msgr. McRae, Msgr. Kelly and Father Eric Bennett joined us at the Mass. 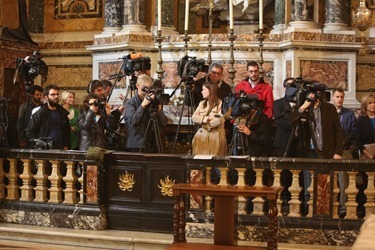 Also with us was the Italian and international press en masse. The Italian papers were all writing about the Archbishop of Boston being the next Pope and taking polls and surveys and the Italians were all voting for me because they liked St. Francis, I think. I don’t really know, but I was so amazed by the whole process. 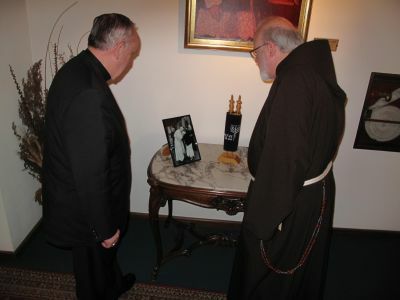 The Carmelite Friars were very, very gracious, as always. Then, afterward, we had lunch with them. 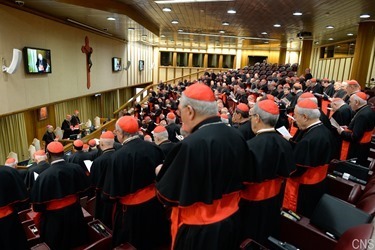 Monday, the congregations ended and Tuesday morning we had the Mass Pro Eligendo Romano Pontifice, the Mass for the election of the Pope, celebrated by the Dean of the College of Cardinals, Cardinal Sodano. 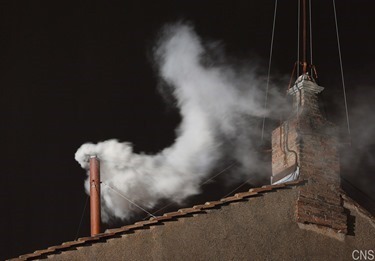 Then, in the afternoon, the conclave began. 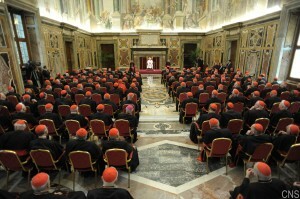 We all had to go to the Domus Sanctae Marthae where we were sequestered for the duration of the conclave. That afternoon, we went to the Pauline Chapel where we prayed and then went in procession to the Sistine Chapel, chanting the Litany of Saints. When we arrived at the Sistine Chapel there were more prayers. 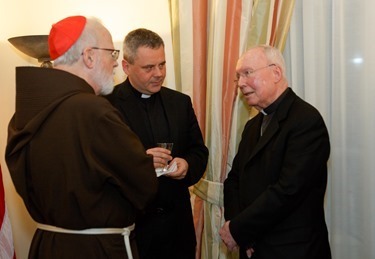 We received a second meditation from Maltese Cardinal Prospero Grech. Then we had the first “scrutinium”, or scrutiny, as the vote is called. The first scrutiny was inconclusive so the ballots were burnt and the black smoke was visible Tuesday night. 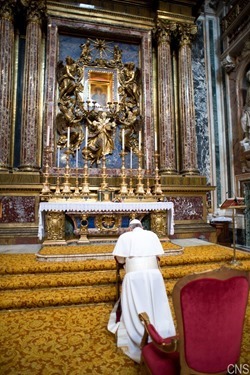 Then, Wednesday, we went once again from the Domus Sanctae Marthae to the Sistine Chapel where we had prayers and two scrutinies in the morning. 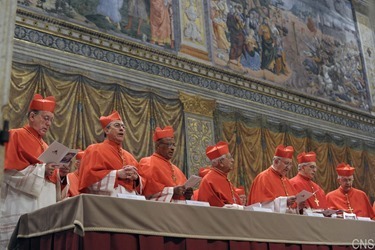 During the votations, each Cardinal went up by order of seniority, holding their ballot in their hand. 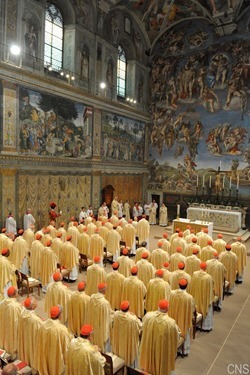 Before placing the ballot in the receptacle on the altar, each cardinal took a vow — standing before Michelangelo’s scene of the Last Judgment — calling on Christ to be our witness in promising that we would only vote for the person we felt God really wanted for the office of Holy Father. It is a very moving experience. Neither of those two scrutinies were conclusive. Between the morning and afternoon gatherings we went back to the Domus Sanctae Marthae. Cardinal Bergoglio and I sat together for lunch. I could see he was under a lot of pressure at that point, and he did not eat much! 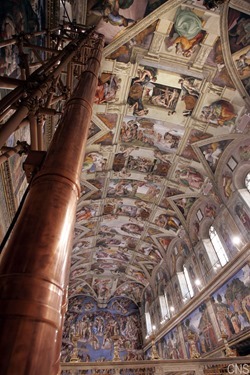 Then, in the afternoon, we returned to the Sistine Chapel for more prayers. 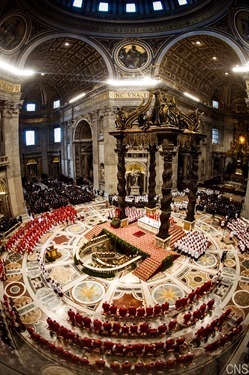 We had two more scrutinies there and, on the second vote, the Holy Father was elected. That was a very emotional and moving moment, when he accepted and announced that his name would be Francis in honor of St. Francis of Assisi. 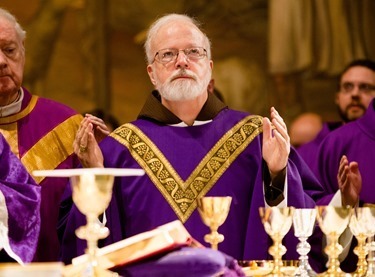 He said very explicitly that he was taking it in honor of St. Francis of Assisi. 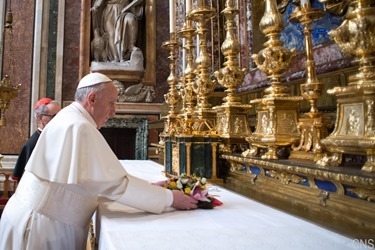 As a Jesuit, he could have said he was taking the name in honor of St. Francis Xavier, who is one of the greatest missionaries in the history of the Church. 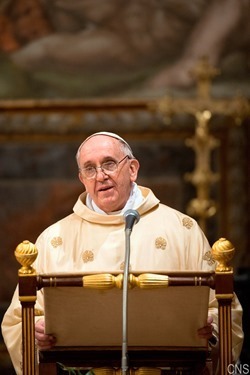 In talking about evangelization, for example, it would have been very understandable, but he specified that he was taking the name of St. Francis of Assisi. 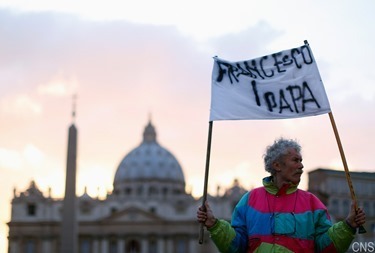 Without having discussed it with the Holy Father, I think that there are some themes from the life of St. Francis that he is trying to communicate by choosing this name. One of the themes of Francis’s life is the call to rebuild the Church, which is a call to reform, to deepening our conversion to the Lord. 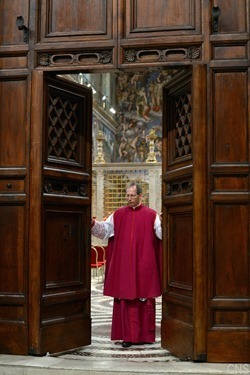 And even in his homily yesterday, the themes he talked about were walking, building and confessing. This reinforces my belief that this is one of the aspects of Francis’s life that he wants to stress. 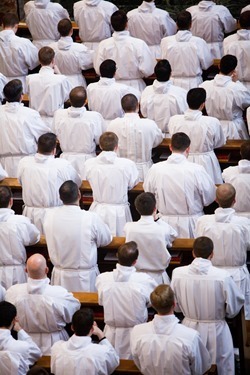 Another theme would be Francis’s theme of universal brotherhood. 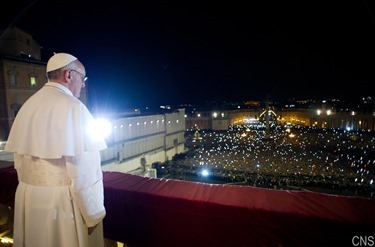 He talked about that in his comments from the balcony of St. Peter’s Basilica: of making a world where we are brothers and sisters to each other. St. Francis, of course, saw himself as a brother to all of creation and to everyone. 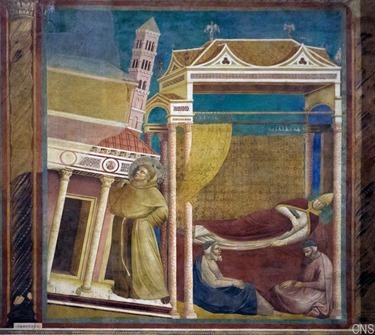 St. Francis also had a special love for the poor, who are a sacrament of the crucified Christ. The Holy Father, in his ministry as archbishop has been so dedicated to the poorest of the poor. I think we will see a continuation of that in his pontificate. Then, each of the Cardinals went up, kissed his ring and greeted him. 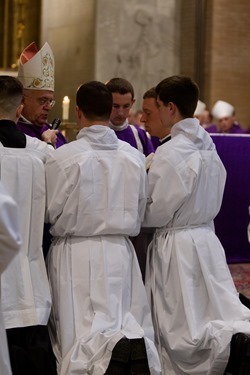 Afterwards, we prayed the Te Deum, the traditional Catholic prayer of thanksgiving, and the Holy Father was taken away, vested in his white vestments, and went to the chapel to pray privately. 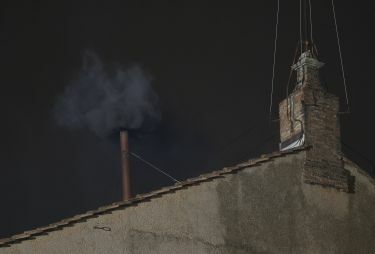 It was then that the ballots were burnt and the white smoke and bells and announced to the city of Rome and to the world that the new Holy Father had been elected. 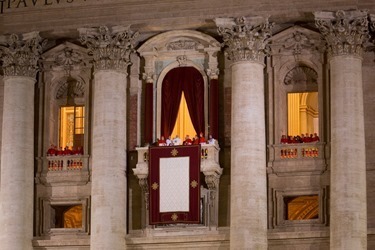 We then went to the loggia overlooking the Piazza of St. Peter’s accompanying the Holy Father. Being on the balcony looking out was just an impressive sight, with hundreds of thousands of people cheering, waving flags and taking pictures. The energy of the crowd was just incredible when they saw the Holy Father. 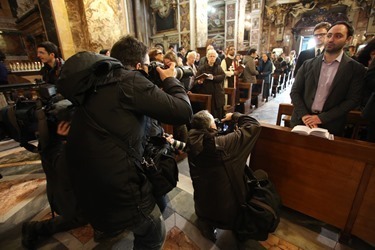 He gave a very warm and simple greeting to the people and asked for prayers for Pope Benedict and then asked for a moment of silence and asked for the people to pray for God’s blessing upon him. 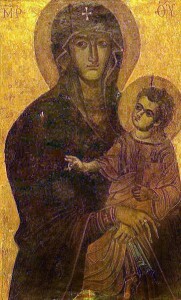 He led the people in the Hail Mary, the Our Father and the Glory Be. This, for me, was a very moving moment because it occurred to me that these very simple prayers are the ones that every Catholic knows, whether they be illiterate or a rocket scientist, whether they are children or elderly. These are the prayers that unite us as a Catholic people in our life of faith and worship of God. 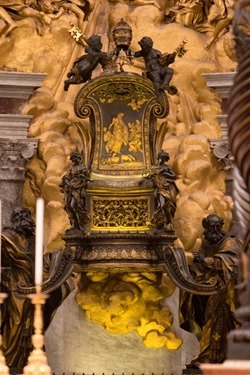 Then, the Holy Father announced to the people that he was going to go the next day to the Basilica of St. Mary Major to pay a visit to the famous icon there attributed to St. Luke, the Salus Populi Romani, the patroness of Rome. Then after giving his blessing Urbi et Orbi, he returned with us to the Domus Sanctae Marthae, where we had a festive meal with him. The following day he went to the Basilica and prayed before the image of Our Lady, placing a bouquet of flowers before her. 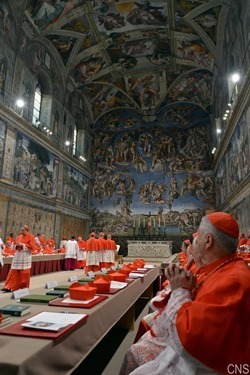 Then, in the afternoon, we had a Mass at the Sistine Chapel that the cardinal-electors concelebrated with the Holy Father. He preached a very spontaneous and lovely reflection. 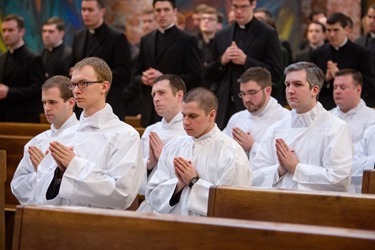 Last night, I gathered with the seminarians here at the North American college to pray compline. 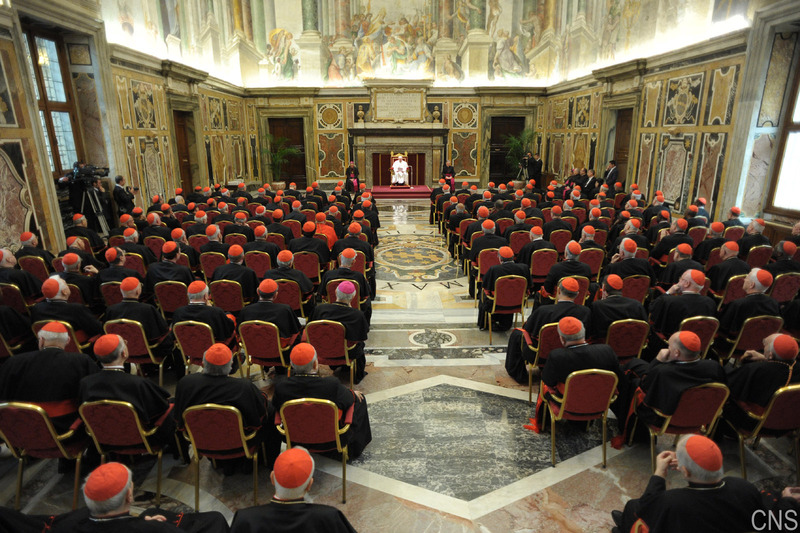 Earlier today, we had an audience with all the cardinals together and the Holy Father. There seems to be a great deal of interest in the process of burning the ballots. After each scrutiny, they burned the ballots strung together a needle and thread, so that everything is destroyed. And they also burned all the papers that we used – for example anything you may have taken any notes on. 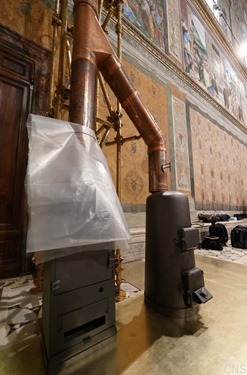 It was interesting to enter the Sistine Chapel and see they had built this big contraption with all kinds of copper pipes going up to the ceiling that of course is never there otherwise. 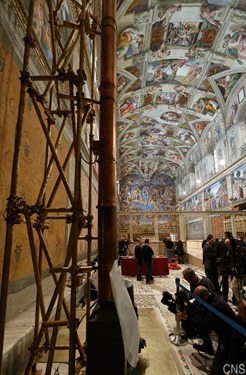 One question I have been asked is if there was smoke in Sistine Chapel when they burned the ballots. During one of the scrutinies there was a little smoke. I understand that in the past it could be very smokey, but this time there was just a little bit that one time. It certainly is an extraordinary venue. 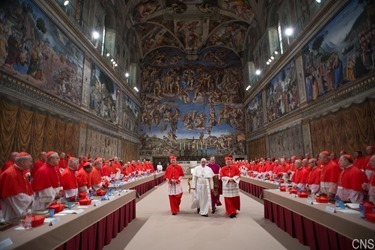 For 500 years this has been the venue the Cardinals have used to elect the new Holy Father overseen by the whole of salvation history, beginning with the famous Creation of Adam — which was right above where I was sitting — to the very dramatic depiction of the Last Judgment. 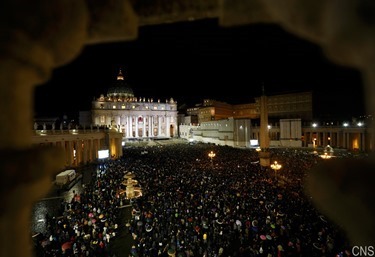 On any given day, between 20,000 and 30,000 people visit that Chapel. 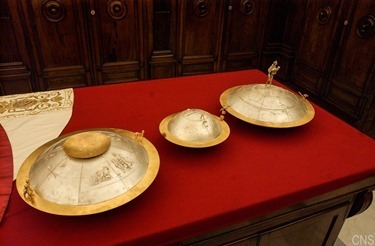 I know many of people say “Why does the Church have such great treasures,” but the Church holds these treasures as part of the patrimony of the Italian people and of the world. Anyone at all can go in to St. Peter’s and enjoy the beauty of the Pieta which is there for all to see, free. The Church is a patron of the arts and supports these very beautiful works of art that help us to glimpse the beauty of God. It is a service that the Church provides to humanity. Also, regular readers will know that I did not post a blog last week. 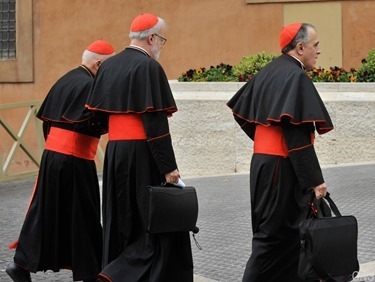 This is because, in the spirit of confidentiality of the congregations leading up to the conclave, all the cardinals were asked not to make public statements. However, there are a few events from last week I would like to share with you. 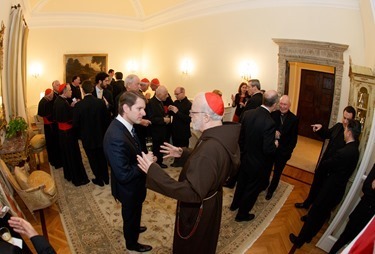 On Friday March 1, they had a reception in honor of the American Cardinals at the US Embassy to the Holy See. 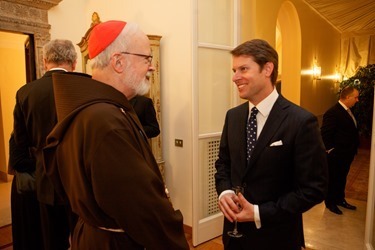 At this time there is no American ambassador to the Vatican but the Chargé d’Affaires’s Mario Mesquita from California gave us a very gracious welcome. 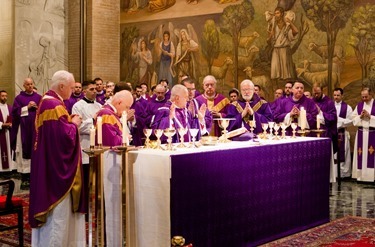 On Sunday March 3, I concelebrated Mass with a number of other American Cardinals at the North American College. 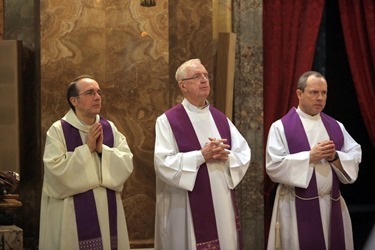 The main celebrant and homilist Archbishop DiNoia, vice president of the Pontifical Commission “Ecclesia Dei”. 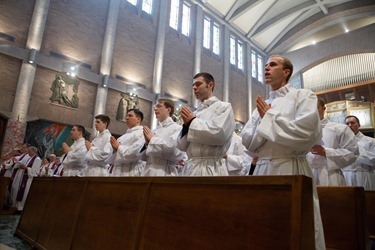 At the Mass about 70 seminarians for dioceses around the country received the ministry of acolyte. 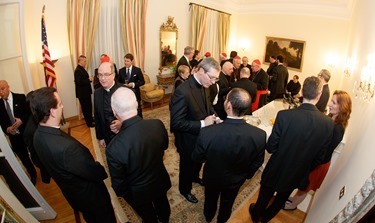 Also, as I always like to do, I took the occasion of being in Rome to meet with our seminarians studying there. 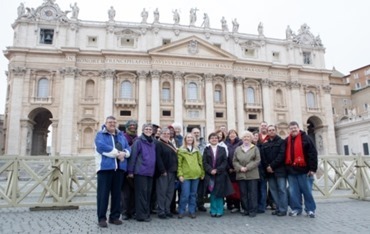 I was happy to meet during the week a group of pilgrims from St. John’s Seminary’s Masters of Arts in Ministry program that in a happy coincidence were visiting Rome. 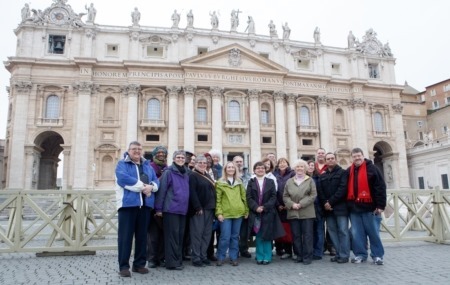 The group, led by Father Chris O’Connor, vice rector of St. John’s Seminary and director of the Theological Institute for the New Evangelization was visiting Poland and Rome in a pilgrimage on the footsteps of Pope John Paul II. 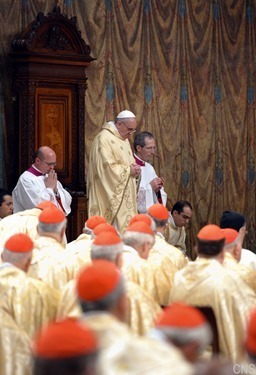 For us, as Catholics, the selection of the Pope is something very, very important. 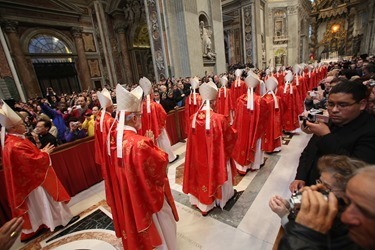 The decision of Pope Benedict to retire was, in some ways, a crisis for us and so the election of the new Holy Father is a great consolation to the Catholic people with its sense of continuity in the Church. 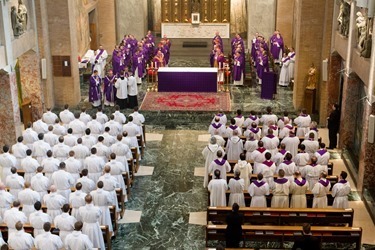 We have been so blessed in the last century and a half with so many exceptional and holy men who have led us in the Catholic Church, though each of them was so different from the one who came before. I think that is what we see here. 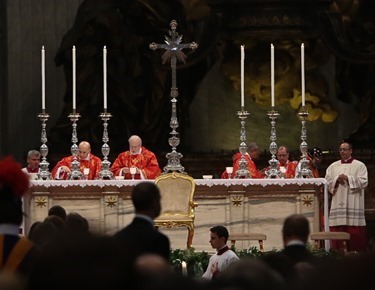 Someone told me the Italians have an expression, “After a fat Pope, a thin Pope” which shows that each one is different and each one has different gifts that they bring to their ministry in the Church. 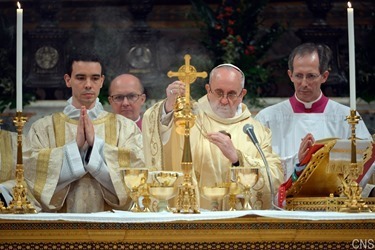 I am sure that Pope Francis, just as Pope Benedict, will share with us the wonderful gifts and talents that God has given him to be put at the service of God’s people.